Royal National Park Coast Track: National Parks web page with practical information for walking this section from Bundeena to Otford. Forest Walk to Sublime Point Track: National Parks web page describing this section along the Illawarra Escarpment. Illawarra Escarpment Walking Track (PDF): A brochure produced by Illawarra NPA of the new track along the Illawarra Escarpment from Stanwell Park to Austinmer. Grand Pacific Walk: A proposal by Wollongong City Council for an urban-fringe style walk from Stanwell Park to Lake Illawarra - it will offer a variant to the Escarpment and will no doubt provide the best way to cross The 'Gong. Kiama Coast Walk (PDF): A downloadable brochure of this new track which forms part of Stage 2 of the walk. Seven Mile Beach Sand Track Walk: National Parks web page describing a short variant to beach-walking, which explores the coastal forest. White Sands Walk and Scribbly Gum Track: National Parks web page describing a loop variant that takes in several beaches on Jervis Bay. Hyams Beach Trail: National Parks web page describing a short 2km section of the walk past Hyams Beach. Burrawang Track: National Parks web page describing a short section of coastal wetlands and rainforest from Conjola to Buckleys Point. Pot Holes Walking Track: National Parks web page describing a short variant through coastal heath south of Dolphin Point. Meroo Head Walking Track: National Parks web page describing a short section from Meroo camsite to Meroo Lake. Meroo Lakes Walking Track: National Parks web page describing a short section from the beach below Meroo Head to Meroo campsite. Nuggan Point Walking Track: National Parks web page describing a short section from Meroo Lake to Bawley Point. Murramarang Aboriginal Area Walking Track: National Parks web page describing a loop through this Aboriginal heritage area. Pretty Beach to Durras Mountain Walking Track: National Parks web page with practical information for walking this section in Murramarang National Park. Pretty Beach to Pebbly Beach walking track: National Parks web page describing the first part of a coastal variant to the Durras Mountain track. Pebbly Beach to Snake Bay walking track: National Parks web page describing the second part of a coastal variant to the Durras Mountain track. Southern Shoalhaven Coast Walk: A proposal by John Souter for a 4-day walk from Narawallee to Durras, with nice descriptions of this part of the walk. Honeysuckle Beach walking track: National Parks web page describing the track from Honeysuckle Beach to North Head campsite. Mangrove Walk: National Parks web page describing a short section of track at Cullendulla Creek Nature Reserve. Bingi Dreaming Track: National Parks web page describing this aboriginal heritage trail that forms part of the walk from Congo to Tuross Head. Kangarutha Walking Track: National Parks web page with practical information for walking this section from Tathra to Bournda Lake. Haycock Point Walking Track: National Parks web page describing a track variant from Pambula to Barmouth Beach. Light to Light Walk: National Parks web page with practical information for walking this section from Ben Boyd Tower to Green Cape Lighthouse. Merrica River nature trail: National Parks web page describing the route from Merrica River to join up with the Nadgee Wilderness Trail. Nadgee Wilderness Walk: National Parks web page with practical information for walking this section from Merrica River to Mallacoota. Beachsafe by Surf Life Saving Australia gives descriptions of most of the beaches that you will walk on, as well as swell, tide and weather information for up to seven days. A smartphone app can also be downloaded from the site. Click on the icons to download a GPX or KMZ file of the entire Great South Coast Walk and track variations. Remember, this route data is for visual representation during trip planning and is not intended as a navigation tool. You should carry hard-copy maps with you when walking the route. Do not rely on electronic equipment, as batteries might expire and the device might fail or break. Disclaimer: These digital files are for non-commercial, personal use only. By downloading them, you accept that their use is entirely at your own risk. We have tried to ensure the accuracy and currency of the data, but accept no responsibility for the results of any actions taken when using the GPX or KMZ files. Routes may be subject to foreseen or unforeseen change at any time and it is the users' responsibility to inform themselves of current track conditions or hazards. Topographic maps (1:25000) can be purchased on-line as hardcopies, or downloaded for free as pdf files, from the SIX Maps website managed by the NSW Government Spatial Services Unit). An interactive map of the state is also available at this site. This could be useful for planning purposes. Recent GSCW walkers, Tom and Jess, devised a way to download topographic or satellite maps to their i-phone, using the Gaia GPS app. This enabled them to use their phone as the main means of navigation. View the steps they took to do this. These people have walked all or part of the Great South Coast Walk. Read about their adventures. Photodiary of a Nomad / The Great South Coast Walk: Personal description and reflections on our 2004 walk from Sydney to Mallacoota. It was the genesis for proposing this long distance walk. Australia: Great South Coast Walk: An American couple, Amy and Jim, found out about the Great South Coast Walk from the Photodiary of a Nomad website above and came all the way to Australia in 2011 to walk it end to end. You can read about their impressions and get some great tips on doing the walk here. Maureen's Meander to Melbourne: Between 2008-2011 Maureen led a series of walks and bike rides from Sydney to Mallacoota, and then on to Melbourne. You can read about her experiences on the Great South Coast Walk here. She Walks: Claire walked the Great South Coast Walk in 2017 and used it to raise funds for the training of midwives in Ethiopia. She has posted a daily account of her walk on Facebook. Ratherbebushwalking: Joanne is walking the Great South Coast Walk in 2018 and is posting a daily account on her Facebook page. These two books by Klaus are worth a read and may well inspire you to do the walk. Bike hire: A novel way to cross the urban fringe areas of Wollongong and Port Kembla would be to hire a bike. South Coast Bike Hire have a mobile hire service, whereby they drop the bikes to you at a pre-arranged location and pick them up from the end location. The area is well served by bike paths to make for a pleasant trip. The most accurate weather forecasts for the next 7 days can be obtained from the Bureau of Meteorology website. Willyweather gives a nice graphic presentation of the BOM weather data. Beachsafe by Surf Life Saving Australia gives descriptions of most of the beaches that you will walk on, as well as swell, tide and weather information for up to seven days. There are quite a few water-crossings on the Great South Coast Walk and some may need to be waded or swum. All tidal crossings can be dangerous due to currents and tidal variations, and should preferably be attempted at or close to low tide when there is little inflow or outflow. The NSW Government produces downloadable PDF and EPUB booklets with the current year's tide tables. This information can be used to plan times when walking sections that have water-crossings. The Bureau of Meteorology also publishes tide charts and on-line tide information on its website. These also provide PDF files of charts for Port Kembla, Crookhaven Heads, Jervis Bay, Ulladulla, Batemans Bay, Bermagui and Eden. Other sites, such as Moruya and Gabo Island are on-line. Willyweather gives a nice graphic presentation of tides for the next 5 days for various locations along the south coast. Mobile coverage maps for Telstra, Optus and Vodafone. Need to phone home - some areas of the South Coast are wild enough to not have mobile coverage. The Great South Coast Walk passes through 13 National Parks and six other conservation areas, as listed below. Royal National Park: Opportunities for barbecues, fishing, bushwalking, birdwatching and whale watching. Illawarra State Conservation Conservation Area: Framing Wollongong, the Illawarra Escarpment is a dramatic 30 million-years-old formation, offering scenic lookouts, hiking, walking, birding, and picnic spots. Killalea State Park: Coastlines, rainforest areas, extensive wetlands and seabird breeding areas. Seven Mile Beach National Park: Walk through the forest, admiring the local wildlife, then kick off your shoes and feel the sand between your toes as you stroll back along the beach. Comerong Island Nature Reserve: Encompasses part of the Shoalhaven Estuary, an internationally recognised habitat for a range of shorebirds and waders. Jervis Bay National Park: With its powder-white sands, crystal clear waters, forests, woodlands and wetlands, parts of this south coast park seem untouched by people. Booderee National Park: A bay of plenty, with stunning beaches and surprising wildlife. Conjola National Park: Boasting lakes, ocean and forests, Conjola is a nature-lover’s paradise. Narawallee Creek Nature Reserve: With golden beaches, lush coastal forests and tranquil waterways, Narrawallee Creek Nature Reserve is a little-known jewel on the spectacular NSW South Coast. Meroo National Park: Coastal lakes ideal for kayaking, paddling and fishing, walking tracks and trails for cycling and exploring on your mountain bike. Murramarang National Park: Spanning 44km of dramatic coastline, Murramarang is the ultimate spot to explore the cliffs, headlands and pristine beaches of the NSW South Coast. 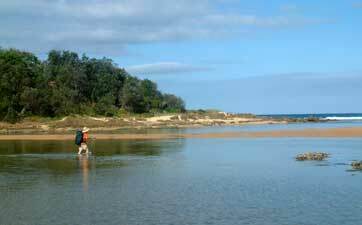 Cullendulla Creek Nature Reserve: Mangrove-lined estuary with scenic views and a rich birdlife. Eurobodalla National Park: There are plenty of coastal lakes, plus lookouts and headlands that offer amazing coastal views, as well as being great vantage spots for whale watching. Biamanga National Park: Jointly managed by Aboriginal people and the NPWS, Biamanga is a significant Aboriginal site filled with dramatic landscapes. Mimosa Rocks National Park: With show-stopping headland views, beaches and pure lagoons, you’ll be spoilt for choice with lookouts, rainforest pockets and historic sites to explore. Bournda National Park: The Far South Coast’s best-kept secret, offering secluded beaches, stunning coastal walks and great birdwatching. Ben Boyd National Park: With rare wildlife, sheltered inlets and 45km of stunning rocky coastline, the park’s rugged beauty is a sight to behold. Nadgee Nature Reserve: A startling area of untouched beauty, Nadgee Nature Reserve is a haven for those who relish getting back to nature and thrive on peace and quiet. Croajingalong National Park: A stretch of true coastal wilderness. As well as seeing what others have observed, you can become a citizen scientist by adding your own flora and fauna observations. This can be done using the downloadable app for android phones or i-phones. Not only can you enjoy the walk, you can contribute to our knowledge of the biodiversity of this magnificent coastline. The walk passes by a number of New South Wale's designated geological sites, which highlight the diverse geological features of the route (see links below for more detail). Illawarra Escarpment: The escarpment cliffs and plateau are comprised of massive beds of durable quartz sandstone lifte 600m above sea level by the warping of layers. Bombo Headland Quarry: Juxtaposition of sedimentary sandstone and volcanic basalt layers - with impressive columnar jointing. Kiama Blowholes: Latite lava rock platforms eroded by the sea to produce two spectacular blowholes. Ulladulla Fossil Beds: Siltstone rock platforms containing an abundance of Permian marine invertebrate fossils. Murramarang Unconformity: Where the Permian sandstones of the Sydney Basin meet the much older metamorphic Ordovician rock beds. Guerilla Bay: Guerilla Bay rocks are some of the oldest rock formations on the east coast of Australia and were once part of an ancient subduction zone. 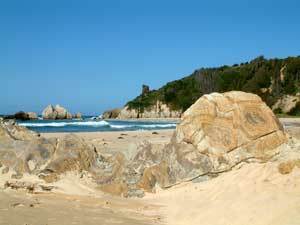 Bingie Bingie Point: The northern end of Bingie Beach comprises a spectacular display of intrusive igneous rocks. Narooma Accretionary Complex: Cambrian pillow lava formations and chevron folded rocks created by the collision of tectonic plates. Mystery Bay: A kink zone of sedimentary cherts, mudstones and slate from the Ordovian Period. Tilba Headland: Igneous dykes and quartz veins intruding into the sedimentary Ordovician beds. Mimosa Rocks: Highly folded and faulted sedimentary rocks such as slate, siltstone and shale deposited during the Ordovician period plus an array of volcanic materials. Ben Boyd Laterites: A folded Devonian strata of red, brown and green shales, sandstones, siltstones, conglomerates and quartzites.